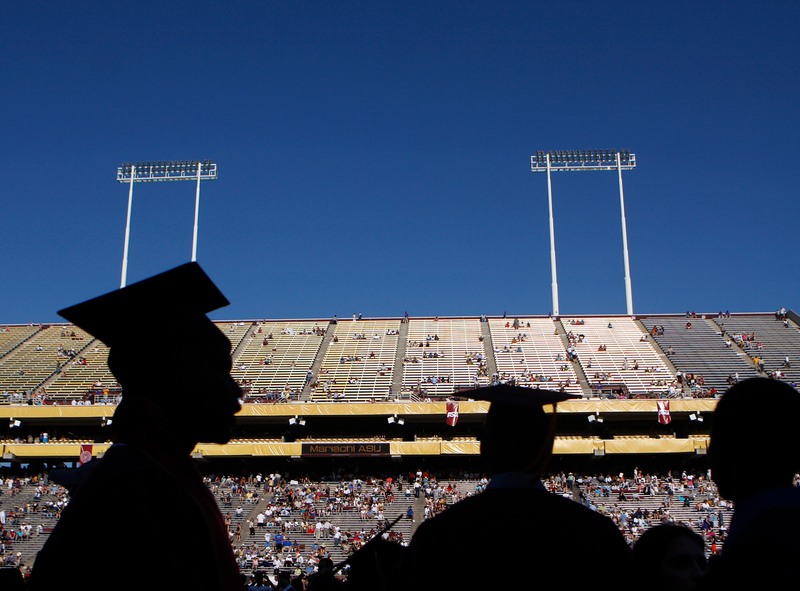 Arizona State University graduate students are silhouetted during their graduation ceremony at Sun Devil Stadium in Tempe, Arizona, May 13, 2009. President Donald Trump has made no secret of his desire to radically revamp America’s immigration policies. Indeed, his family separation policies, which sparked nationwide protests and public revulsion after they were rolled out in May 2018, were merely the latest in a series of efforts to close America’s doors to immigrants and refugees. According to the Financial Times, the Trump administration also considered another similarly radical change in U.S. immigration policy. Early in 2018, senior White House officials pushed a proposal that would end all student visas for Chinese nationals. If implemented, the economic and political impacts of such a policy would have been huge: they would have marked a major step backward for America’s commitment to openness and academic freedom, and would have likely done deep damage to U.S.-China relations at a time when frictions between the two countries are already high. Though more moderate voices, including U.S. Ambassador to China Terry Branstad, convinced Trump to hold off on a total visa ban, the FT reported, some of its supporters continue to push for its adoption. Trump himself seems to have some sympathy for a total ban. According to Politico, Trump told a group of U.S. business leaders at a dinner meeting in August 2018 that “almost every [Chinese] student that comes over to this country is a spy.” That a U.S. president would make such a shockingly inaccurate and racially-tinged statement would have once seemed shocking. And yet, given President Trump’s steady stream of vituperation, his Chinese spy comment failed to garner much attention. Nonetheless, President Trump likely remains open to new efforts to radically restrict Chinese student visas. Yes, U.S.-China ties are beset by a growing number of problems. The United States has a long list of grievances with Beijing, including unfair trade practices, human rights violations, and China’s illegal behavior in the South China Sea. Without doubt, Washington should look for ways to push back against Chinese actions that harm U.S. interests. But a blanket ban on all Chinese students would be seen, rightly, as a gross overreaction. Perhaps unsurprisingly, Chinese students are key consumers of higher education in the United States. During the 2016-2017 academic year, over 350,000 Chinese students attended U.S. institutions of higher learning, and comprised roughly 33 percent of the total number of international students studying in the country. Chinese students inject an added $12 billion annually into the U.S. economy with their spending on tuition, housing, and other expenses. In many cases, the contributions of Chinese students don’t end after graduation. Many students remain in the United States and add to the pool of talent that U.S. companies can draw from. According to the National Science Foundation, data from 2015 showed that nearly nine out of 10 Chinese graduate students with Ph.D.s intended to stay in the United States after graduation. Chinese students also regularly participate in the Optional Practical Training program, which allows recent graduates to remain in the country for up to three years to gain hands-on work experience. Though the Trump White House held back on a full ban, the Administration has already taken several steps to shift U.S. policy. These new policy moves will make it more difficult to attract Chinese students to U.S. universities, and to retain them as valuable contributors to the U.S. economy once they graduate. On June 11, the State Department moved to shorten the length of visas granted to Chinese students intending to study robotics, aviation, and high-tech manufacturing from five years to one year. This change will force Chinese students in these fields to reconsider whether they should come to the United States; returning to China to visit family would require a new visa, a process which could take months. As a result, U.S. universities vying with other top non-U.S. institutions for Chinese doctoral students now find themselves at a real disadvantage. Other broader changes to the U.S. immigration system have also impacted the ability of Chinese students, among others, to contribute to our economy after graduation. Under the April 2017 Presidential Executive Order on Buy American and Hire American, the federal government has made it more difficult for foreigners to work in the United States. For decades, many Chinese graduates have used H-1B visas, which allow U.S. companies to hire high-skilled foreign workers, to stay and contribute their skills. However, the most recent analysis from the non-profit National Foundation for American Policy shows a spike in administrative delays, as well as a 41 percent increase in rejections between the last two quarters of the 2017 fiscal year. Without action from Congress, the Trump administration’s xenophobic policies will push away highly talented graduates from China and other parts of the world. Some recent reporting already suggests that more Chinese students are choosing to go elsewhere to pursue advanced degrees. Students cite Trump’s hostility as a major factor. In our competitive, globalized economy, we need talented people to come to the United States to help drive research and innovation in our universities and the private sector. Without question, the theft of scientific innovations by people who have sent secrets to China is a real concern. There should be greater consultation between national security officials and university officials to address this very serious problem. The U.S. government should also vigorously prosecute legitimate cases of espionage involving China. A comprehensive approach would also include more discretion by U.S. companies entering into technology transfer agreements with Chinese counterparts, as well as improved cybersecurity measures by key private and public sector actors. For decades, U.S. preeminence as a beacon of educational opportunity has fueled economic growth. The thousands of Chinese students studying at universities across the United States are a big part of that success story. Their continued presence on U.S. campuses should not be seen as a threat, but as a concrete example of how attracting a diversity of people—many of whom become citizens—serves the national interest. If Trump and his advisors continue to push their reactionary immigration policies, we must redouble our commitment to fight for our values and the contributions from abroad that help America succeed.